Since starting working as a Personal Stylist in 2009, I don’t think I had a lady to whom I would not recommend a black or/and navy PENCIL PANTS AS AN AMAZING, SHARP AND VERSATILE KEY WARDROBE STAPLE. And this is regardless of my client’s size, age or occupation!! I am a true lifetime fan, a regular wearer and a firm ” believer” in this style of trousers. To say that I am a regular wearer is actually an understatement . It is part of my styling uniform and my “signature look” at work . This is what I choose to wear the most when I am running Style Workshops or take my private clients shopping in the City or Chermside. Especially in winter. SO HERE IS THE REAL DEAL AND MY BEST TIPS! My favourite cut is ALWAYS TAPERED AND FITTED AROUND THE ANKLE AND NEVER STRAIGHT AND LOOSE!! This is one of the keys to the most flattering , chic and timeless look that never dates. Choose the pants that have a slight STRETCH in the fabric (it should have 3-5% or more of elastane or lycra in it). This will ensure that you have the most amazing fit when you choose the size right. Go by the fit not by the size number when trying them on. They should be snug and fit you like a glove. The stretch will give you shape support and tone. If you can find them, look for pencil pants that are CUT AS ONE PIECE and don’t have a separate waistband. They will usually have a zip on the side and are way more comfortable and stretchy around the waist. HIGH-WAISTED are a must for an HOURGLASS OR PEAR body shapes. FOR INVERTED TRIANGLE, RECTANGLE AND APPLE body shapes it is a matter of preference and many of these ladies like high waist for support when there is no waistband. However, I met some women who don’t like anything tight around their waist (even with a stretch) and they can have a lower waist. The MOST VERSATILE AND PRACTICAL COLOURS would be BLACK and DARK NAVY (not blue). They will go with any colour tops and even beautiful florals (not easy to find!) and small geometric patterns. You can treat dark navy as black and will be amazed that it is just as versatile. In SUMMER ANKLE CROPPED PENCIL OR CIGARETTE PANTS are OK and in winter choose full length. Unless you are in perfect shape, DON’T TUCK YOUR TOPS IN (as in the picture). Leave them OUT but make sure they are LONG ENOUGH or come down to the WIDEST POINT OF YOUR HIPS. Armed with these tips you can go and look for the best pair of pencil pants you ever had! Just be aware that there are many around and most of them are not flattering. There are hits and misses with any brands. My guidelines should steer you in the right direction though. 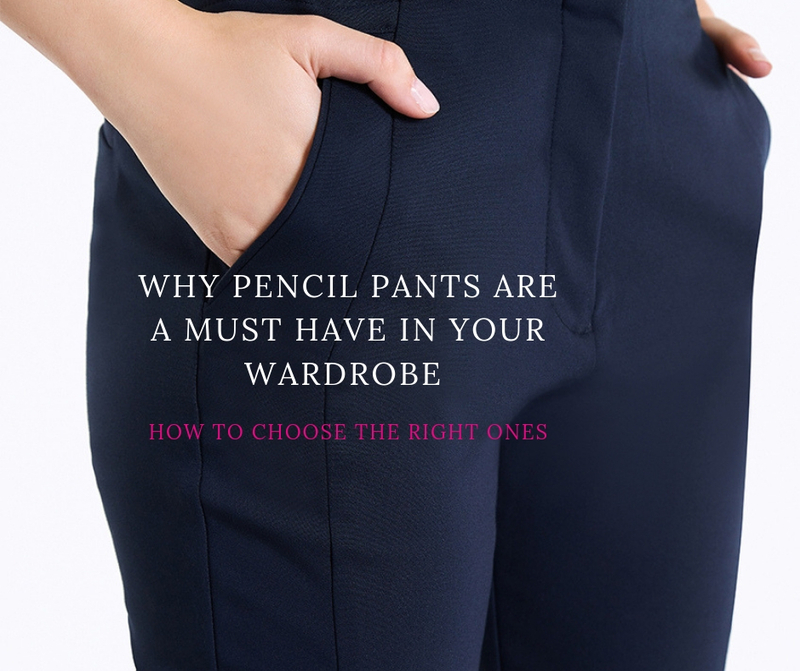 The most efficient and quickest way to find the right pencil pants and much more!! for you, is to BOOK A SHOPPING TRIP IN THE CITY OR CHERMSIDE with School of Style. 3 HOURS OR FULL DAY SHOPPING including LUNCH are available. Just FILL IN THE BOOKING FORM and I will get back to you ASAP to confirm the date. I will be able to identify your shape and take you straight to the right brands. Alternatively, buy the E-BOOK corresponding to your body shape. it has everything you need to know to look your best! !